Although often overlooked as a design element, pathways add visual interest. They become pivotal pieces of garden art, helping tell the story of your garden. 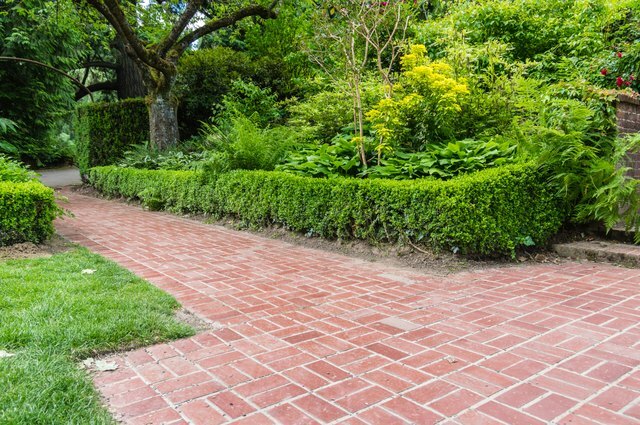 While classic brick or concrete remain important players and may be ideal for your landscape, several other options also exist. Art is different for everyone; let your pathway express you by choosing a style that suits your lifestyle and creative side. Naturally shaped stones, such as flagstone or slate, work nicely in formal or informal landscapes as the backbone of your path. Cut stones, such as rectangle or square pieces, work equally as well. Bricks, a classic choice, can be shaped in numerous patterns with hard lines. While you can use them for curved paths, cutting can be tiresome and more work than other methods. Coarse sand, small pebbles and gravel flow into any shape you want, including sweeping curves or sharp angles. 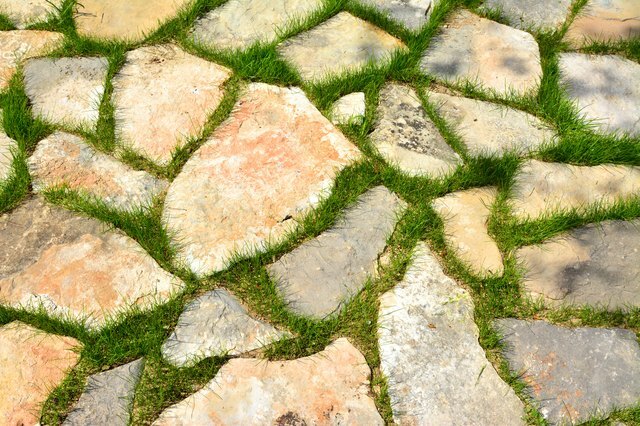 Grass between stepping stones or rock may be a no-fuss way to fill in spaces, but consider using a groundcover instead. Groundcovers grow only to a few inches tall, and many cultivars are exceptionally adapted to handle foot traffic. Blue star creeper (Isotoma fluviatilis) reaches only 1 or 2 inches tall and produces small, star-shaped blue blooms spring through summer. This fairly adaptable plant can handle full sun, part shade or part sun locations. It grows in U.S. Department of Agriculture plant hardiness zones 6 through 9. Lemon dwarf woolly yarrow (Achillea tomentosa) grows in USDA zones 4 through 8. This semi-evergreen groundcover reaches 1 to 2 inches tall and has small, cloud-like clusters of yellow flowers in summer reminiscent of the larger, more common yarrow (Achillea millefolium), which grows in USDA zones 3 through 9. Groundcovers are so called because of their spreading habit. While you won't need to mow, you may need to take care to keep the groundcover within your path. Many of today's pathway stones come in premanufactured shapes that fit together to make different patterns. This takes away the guesswork of cutting the stones yourself. One of the most endearing features of these types of stones is their ability to transform into spirals, crisscross patterns, houndstooth, chevrons or simple squares, just to name a few. Playing with these designs in your garden allows you to express your creativity and tell a little part of the story. Sometimes less is more and makes a bigger impact. Simple square stones spaced evenly in the grass or on a bed of pebbles doesn't take too much in the way of thought, but makes a huge difference -- especially if you never had a path there before. An inexpensive way to show off your creativity is to paint simple stones -- square, rectangle or cobblestone-like patio stones. Several companies now make concrete paint for this type of application; check out your local hardware store's paint department.